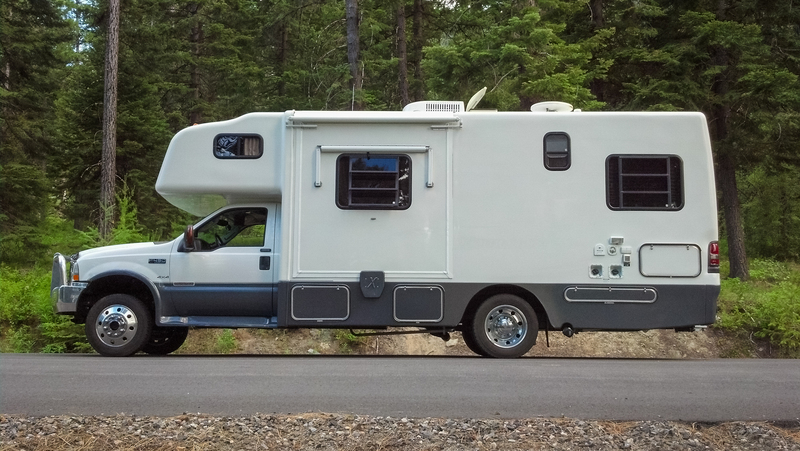 For most people, an RV is not an all-terrain vehicle. It’s a bus, a home on wheels, and a reason to own tiki lights and pink flamingoes. If anything, they encourage their owners to stick closer to the pavement, not venture further from it—unless, of course, you’re Carl Montoya of Just Differentials. 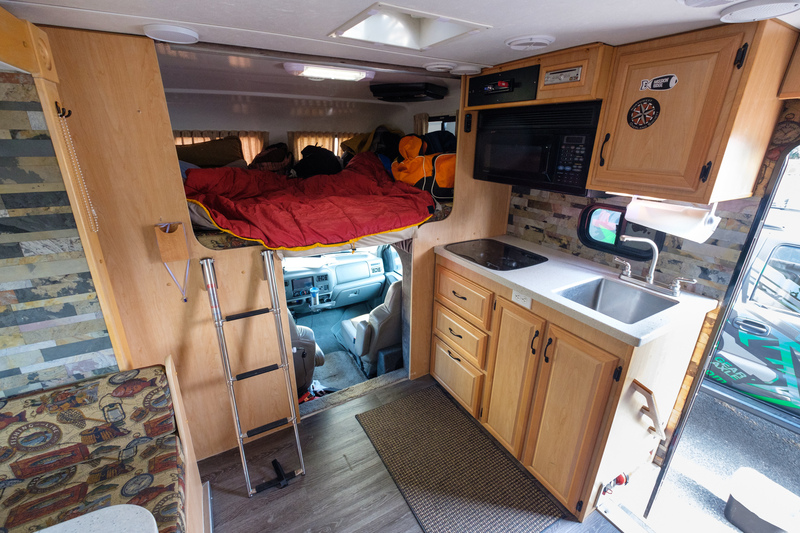 When he needed an RV, he sought out something with four-wheel drive and embarked on a journey of modifications that would land his motorhome a world away from your grandpa’s Winnebago. 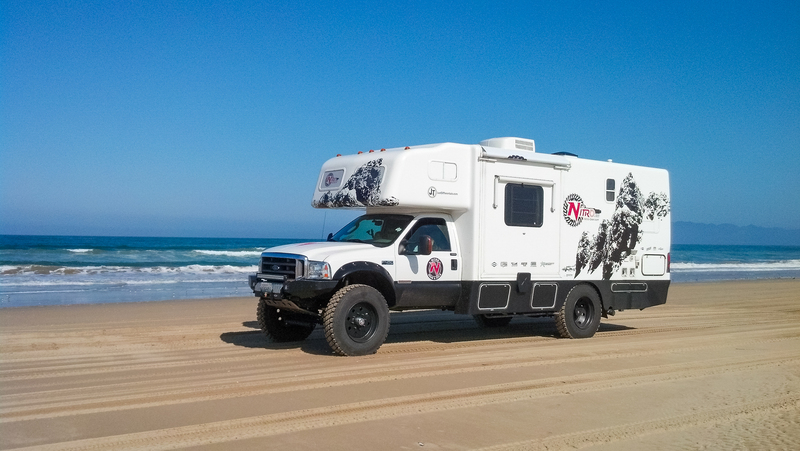 Follow along as we watch Just Differentials and Nitro Gear & Axle turn this camper into an off-road dream machine. 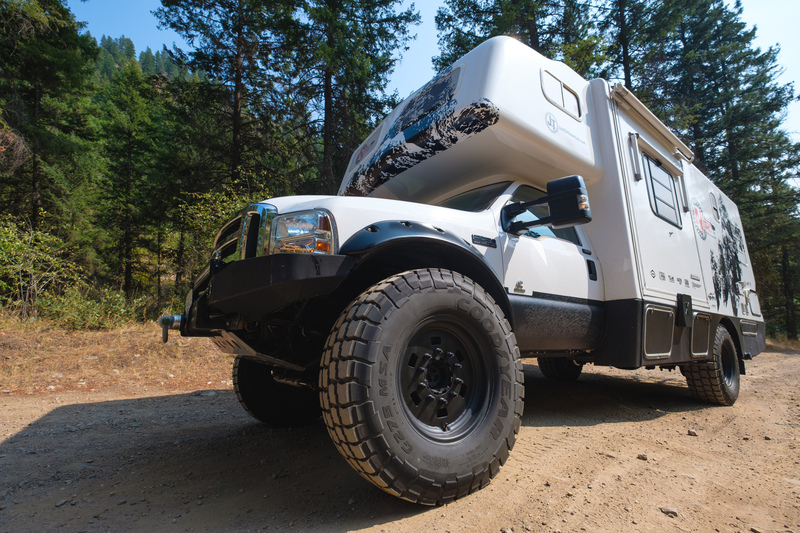 Behind every great build is a purpose, and Nitro Gear’s behemoth is no exception. 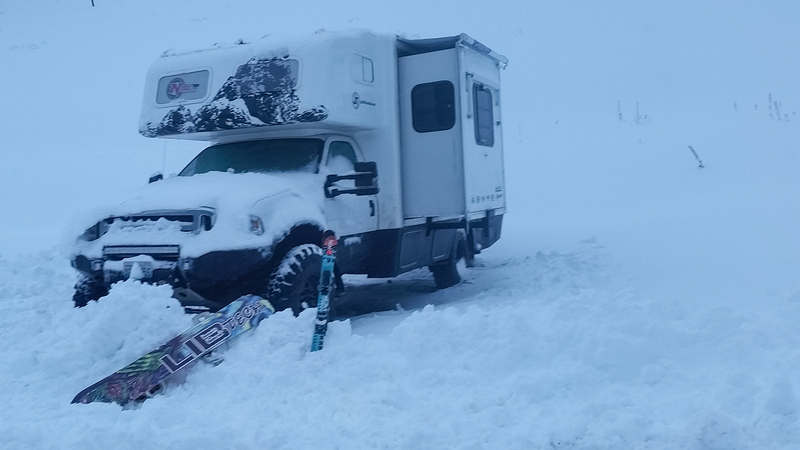 Carl needed an RV to tow vehicles to shows, serve as a base camp at events, and expand their family’s camping season well into the winter months for skiing and snowboarding. After looking at options of every shape and size, he eventually found what he was searching for: a rather rare coach called the Xplorer Xcurison. 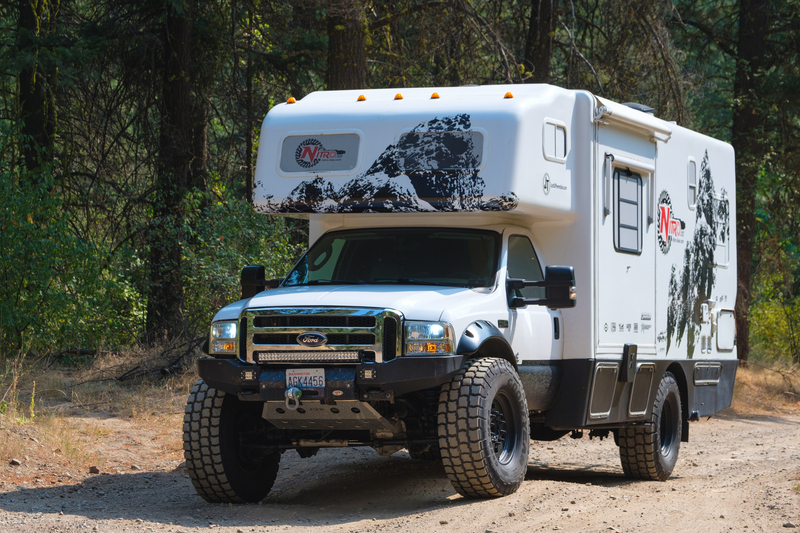 This 2004 model is based on a Ford F-450 chassis and powered by the infamous 6.0-liter power-stroke motor. It packs factory four-wheel drive, a Dana 60 up front, Dana S110 in the rear, and three 20-gallon diesel tanks for a 600-mile range. 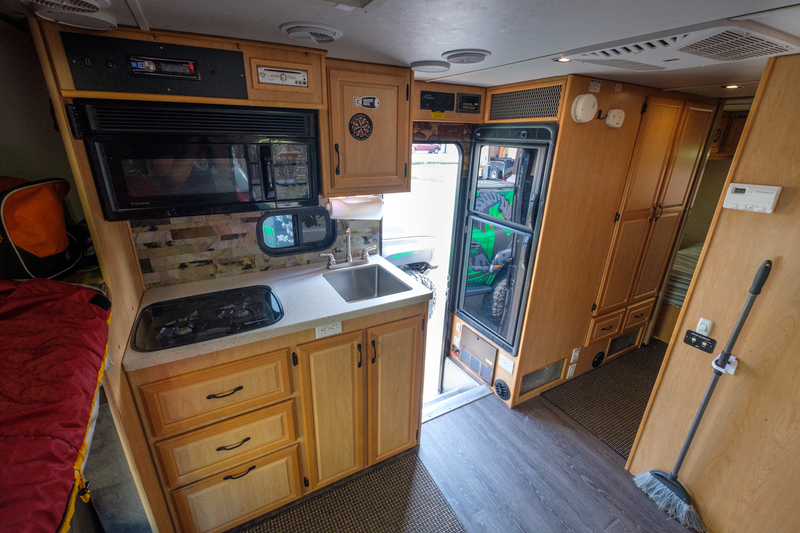 Living appointments include a rear bedroom with queen bed, a queen cabover, a slide-out with kitchenette, a generator, TV, stove, fridge, dual 6V battery setup, and a whopping 100 gallons of freshwater. All of this is tucked inside a one-piece fiberglass shell equipped for true four season camping. For many people, that sounds like an ideal build already, but for Carl, it was simply the beginning. 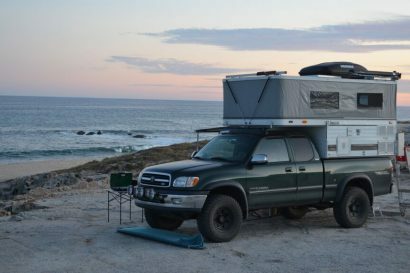 It needed more clearance, more traction, more armor, and more durable components to tackle northern snow storms and reach remote camps. 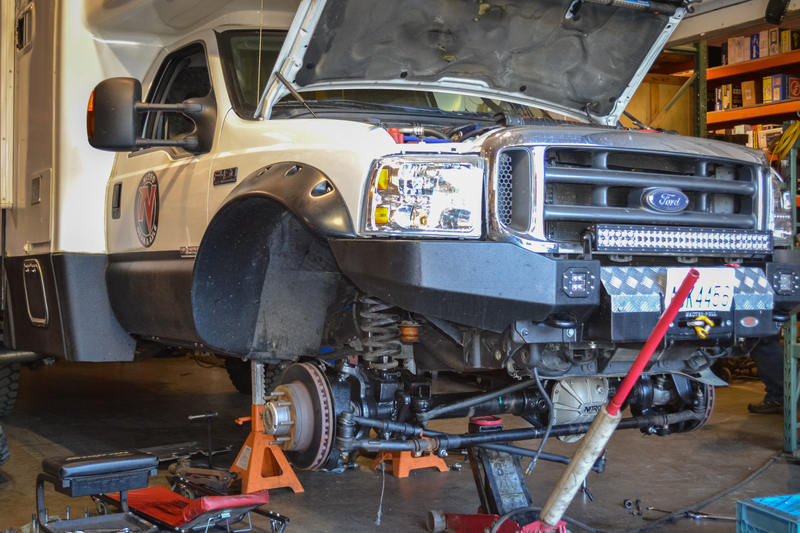 The first order of business was lifting this belly dragger off the ground, a task that started with a more modern coil-sprung front end from an F550. 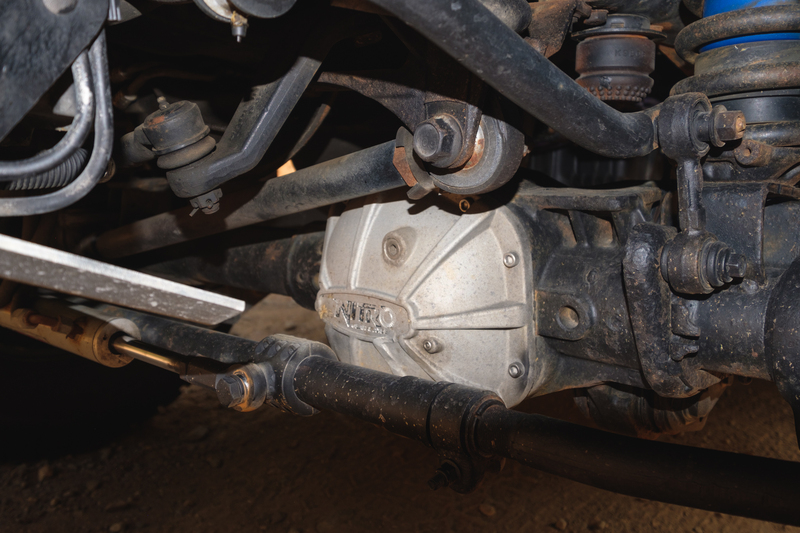 Swapping to this axle provided more room for larger tires, improved track width, provided better handling, and gave the truck a shockingly good turning radius. Next, they needed to upgrade the suspension for additional clearance and weight capacity. This was a delicate balancing act, as they wanted to run 40-inch tires, but didn’t want a ridiculous lift that made the truck so top heavy it was unusable. To solve this, they contacted National Springs and swapped their stock rear packs, which were underrated at 8,750 pounds, to a more suitable 12,000-pound pair. 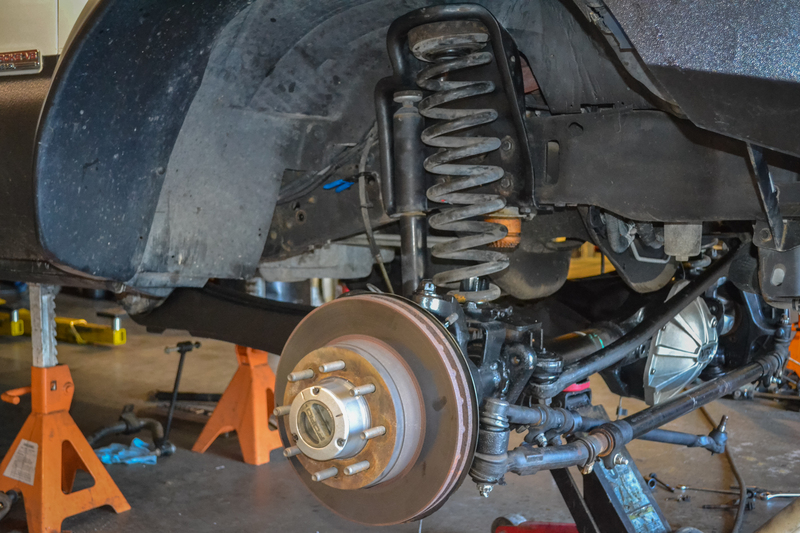 They then added a custom 1-inch spacer block to these new rear leaf springs and used a standard leveling kit on the front coils, which altogether netted around 2.5 inches of total lift. Finally, custom-valved, Radflo 2.5-inch remote reservoir shocks were installed with Hellwig 1.5-inch sway bars and helper airbags to minimize body roll and improve towing performance. Now you might be thinking that 2.5 inches aren’t a whole lot of lift for such a large vehicle, but Nitro Gear had another trick up their sleeves. 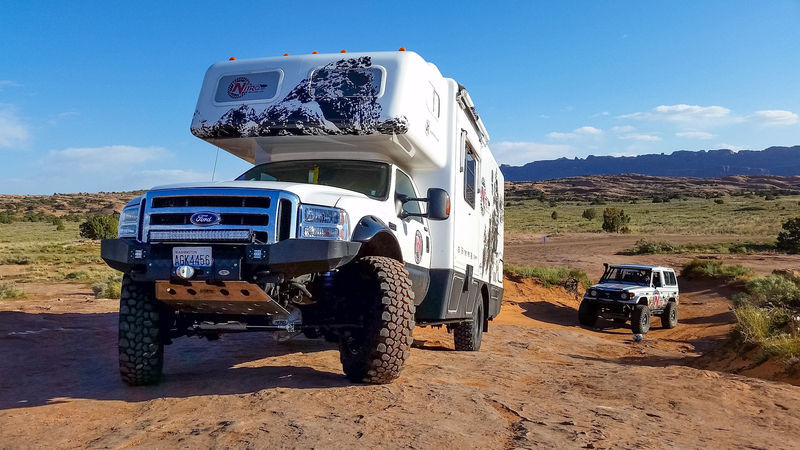 By trimming the front fenders 5 inches and installing Bushwacker flares, they were able to fit a massive set of 41-inch tires without rubbing, giving them the maximum tire size with the minimum lift combo they were looking for. At the same time, they changed out the factory Alcoa wheels for Buckstop heavy-duty super singles. This not only made the tires more stable, but transitioned the rear duals to a single, negating the problem of wedged rocks and debris between the tires while improving traction and flotation in snow, sand, and mud. These changes introduced a new problem though. 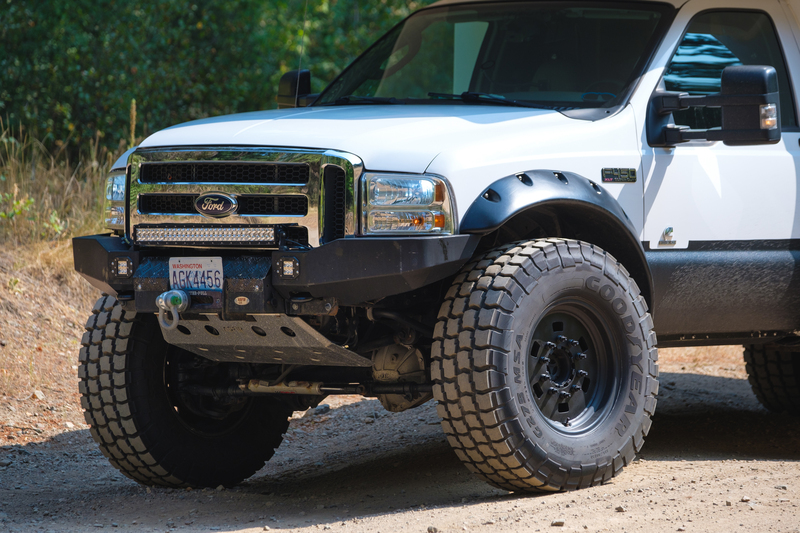 As anyone who has made a massive jump in tire size can tell you, steering was challenging to say the least, so they installed a 05+ F350 power steering box with an F-550 pitman arm, an Icon Armored truck spec pan hard rod, and a PSC 10-inch hydraulic assist ram. The combination can actually turn the massive tires while the truck is stationary without the slightest whine—truly impressive. This still left two issues caused by the massive tires though. The first was ingress and egress to the vehicle. For anyone who isn’t 7 feet tall, it could be a real challenge, so AMP research steps were installed to make it a breeze. The second problem was that the truck struggled to accelerate or even cruise down the highway now that the tires and gear ratio were so mismatched. Luckily, Carl knew exactly how to fix that. 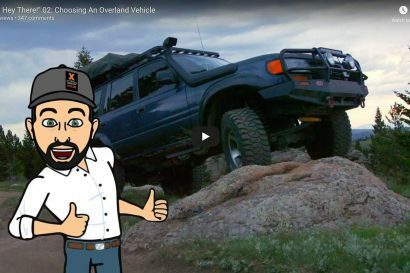 One of the biggest mistakes people make when building an overland truck is failing to re-gear. A simple swap can improve fuel economy, return your power, and keep your transmission running longer, all of which help the gears pay for themselves. Of course, given that this was Just Differentials’ truck, they conveniently had a few sets laying around. That made it easy for them to ditch the standard 4.30’s for a set of 5.38:1 Nitro Gears. To give the truck ridiculous traction, they then added a front Eaton E-locker, and a Truetrac limited slip in the rear. Why not, right? Finally, they finished it all up by sealing them in with a Nitro Xtreme diff cover and Schaeffer’s gear oil for longevity and improved performance. The new gears restored the truck to a nearly stock ratio and gave them a few RPM’s lower on the highway than they had with 4.30’s on factory 31’s. 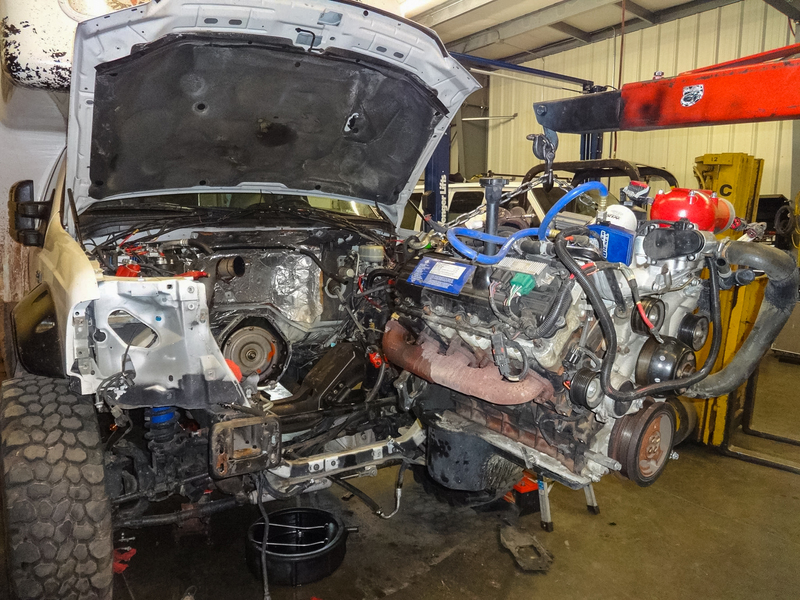 At this point, Carl and the team felt like they were almost done mechanically, but the Ford 6.0 had other plans. As they used the truck on various trips, engine problems continued to crop up, and the expense was quickly building. After the second failed head gasket, they pulled the plug. It was time for something new. 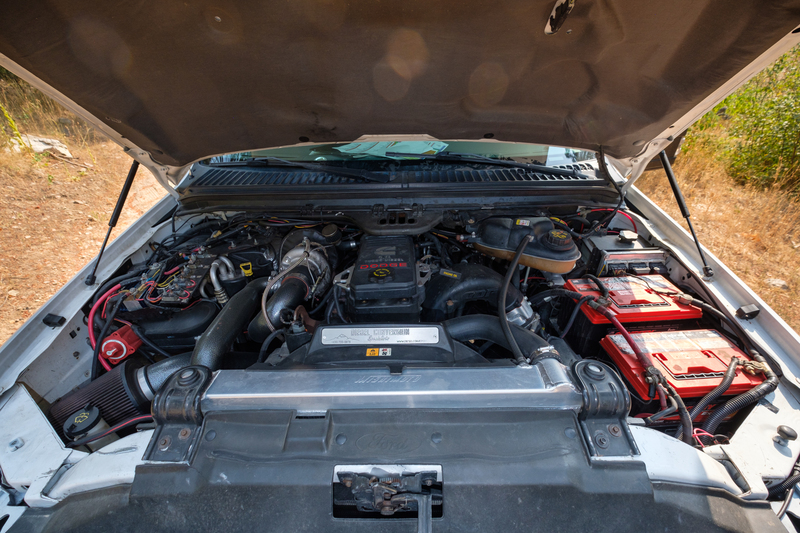 Carl turned to the team at Diesel Conversion Specialists in Kalispell, Montana, for a full Cummins 6.7L swap with new head studs and a banks intercooler. 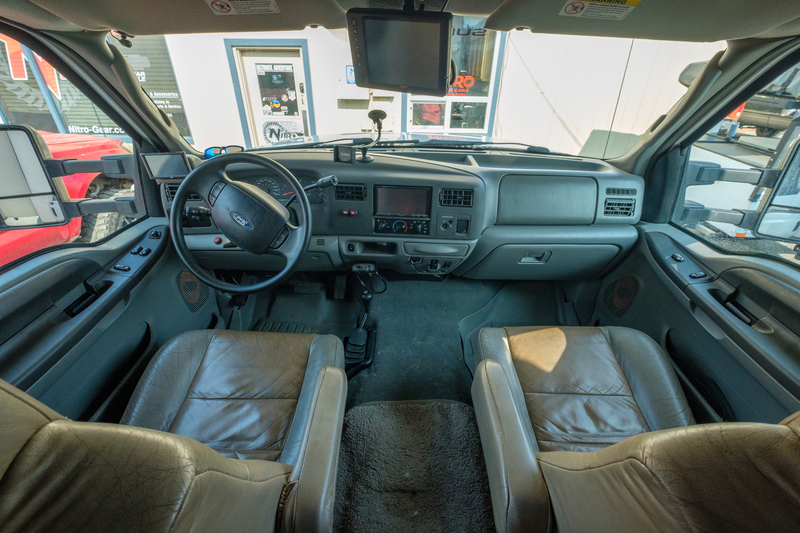 They chose an SCT programmer for additional power, edge gauges for monitoring, and dual Odyssey batteries for cranking. Supporting this new motor is an ATS built 5R110 Torq-Shift automatic transmission with an ATS high-capacity aluminum transmission pan and five star torque converter. While purists may cringe at the mating of a Ford and Cummins, the Nitro team had excellent luck with the change and found it solved all of the engine issues that plagued the Xcursion before. They did want to add just a little extra something though, and Dynomite Diesel Performance had just the thing: twin turbos. Carl states that this was largely done for reliability, quick throttle response, and cooler EGT’s, and that makes good sense to us. We’ll just chock the 1,110 pound feet of torque up to being a happy accident. With such a sizable investment now under the hood, it made sense to add additional protection, so Carl installed a modular ASFIR bumper. This replaced the original Herd Alloy unit that came with the truck, which made sense since it wouldn’t match the new fender line or hold a winch anyway. Inside the ASFIR, a 15,000-pound Milemarker winch stands ready to haul this beast of a truck out of sticky situations, and a Masterpull synthetic line with Factor 55 ProLink is there to help. 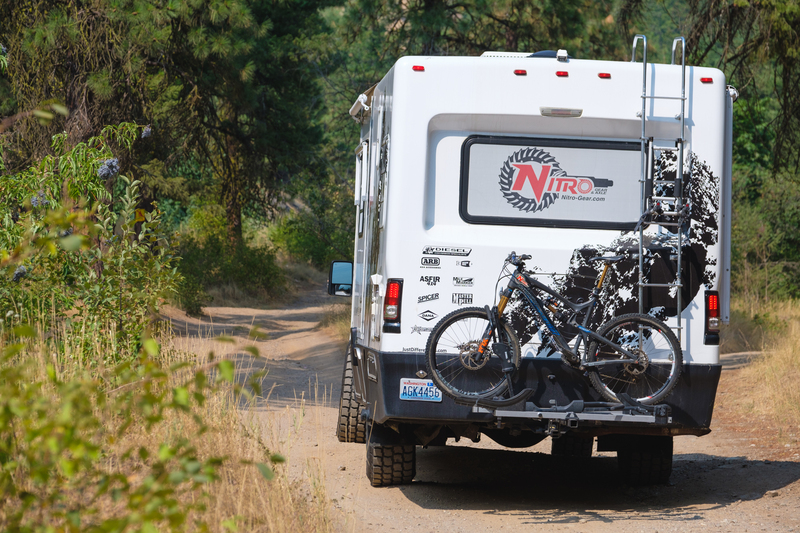 For inflating the Ford’s 41-inch tires, Nitro Gear runs an ARB Portable Twin Compressor with built-in air tank. This can not only make relatively quick work of their inflation times but also run air tools should they be needed on the trail. The Xplorer Xcursion came well equipped for life on the road straight from the factory. 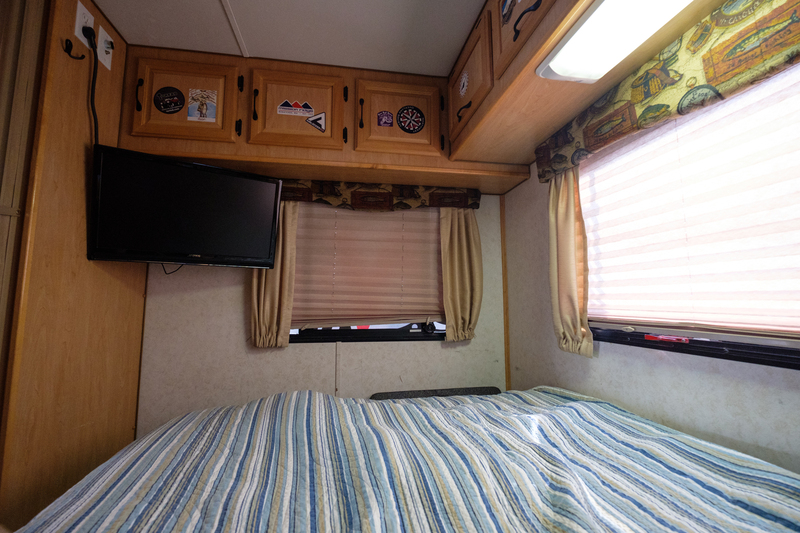 It was an RV after all, so the changes that needed to be made would be minimum, and largely confined to improving the truck’s ability to camp remotely in cold weather conditions. 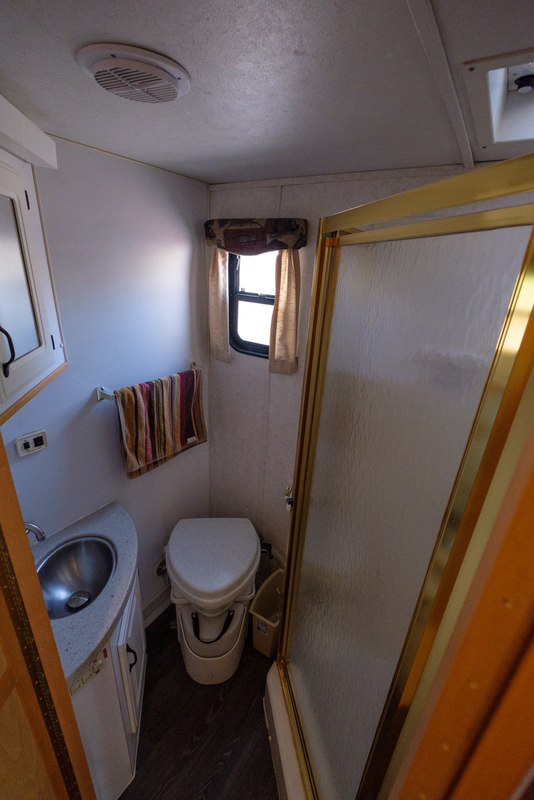 One of the biggest improvements was swapping the standard waste system for a Nature’s Head composting toilet. This has no odor and doesn’t require an RV dump station to be discarded regularly. Best of all, it doesn’t freeze in winter. Trust us, you really don’t want a cracked black water tank to deal with. This didn’t protect the freshwater tank, of course, so Carl added additional insulation and heat ducting for those sub-zero nights. 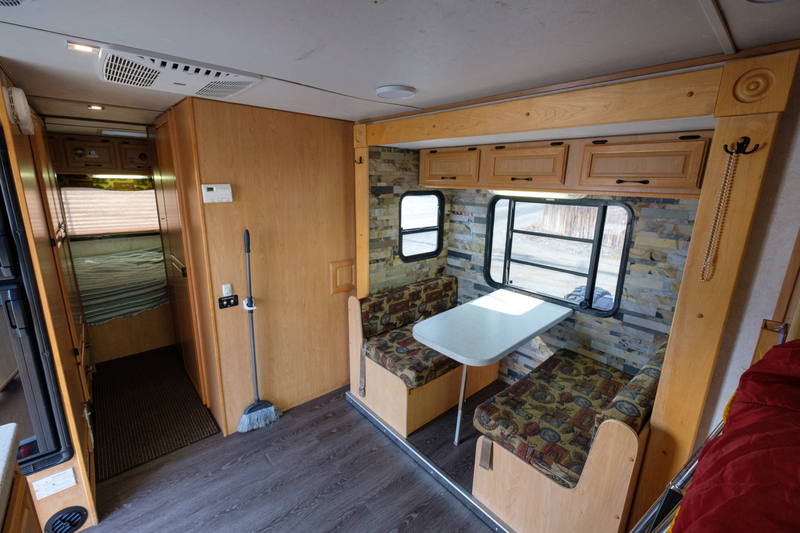 An interior heater can maintain a toasty temperature in the cabin, and dual commercial deep cycle batteries with hard-mounted solar panels will keep the lights on. If power ever does run low, a 5K LPG Onan generator is there for backup duty. 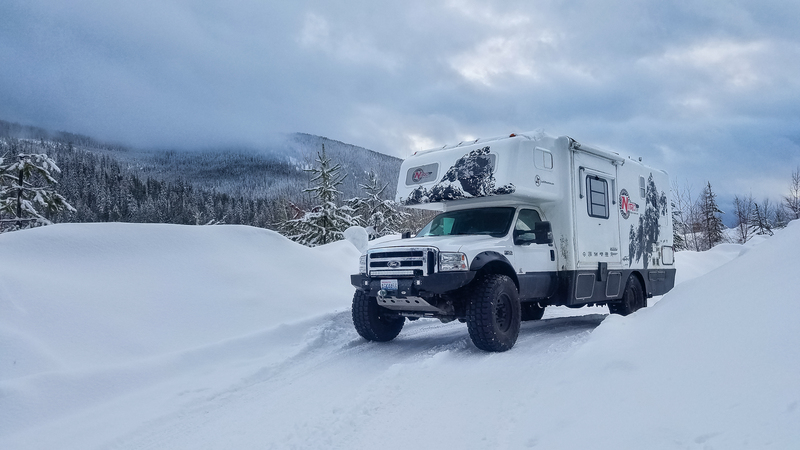 So, whether they’re parked at the base of the slopes, or hunkered down in a snowstorm somewhere in the interior of British Columbia, their family can kick back and relax with a hot cup of cocoa, a warm blanket, and good conversation until the storm passes. Then when they’re ready, the world is right outside their doorway. After driving the Xplorer Xcursion around, I can tell you two things. First, it’s impossible to drive without smiling. Just sitting in the cab and directing the lumbering Ford down the road feels like an occasion. 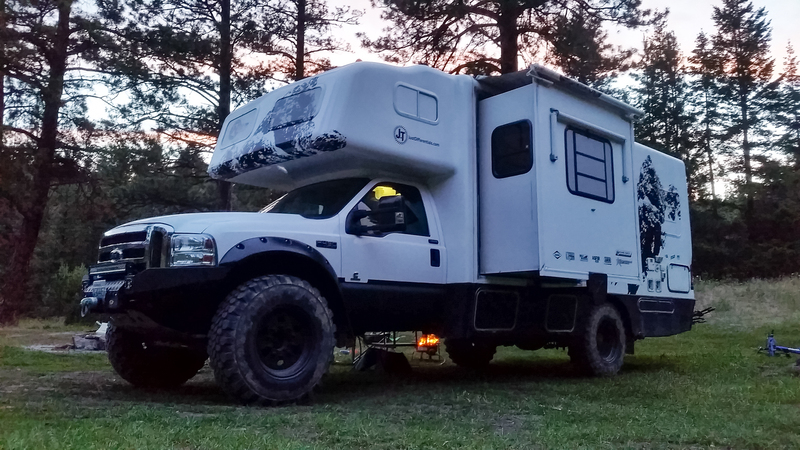 It doesn’t matter if your destination is a remote mountain camp somewhere in Alaska or just the supermarket down the road; in this Ford, it feels like an adventure. Second, it’s not going to fit down most trails. It’s surprisingly nimble for its size, and could easily tackle desert tracks and even some mountain passes, but its capability still can’t compensate for its size on narrow tracks. Fortunately, that doesn’t matter. 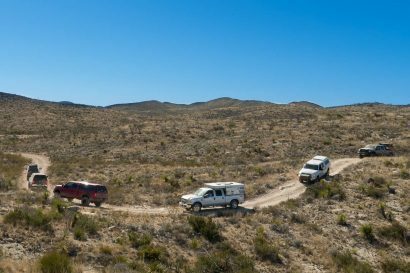 The beauty of this truck isn’t in its ability to traverse rock gardens, but to take you to the source of the real adventure, and serve as a home once you’re there. 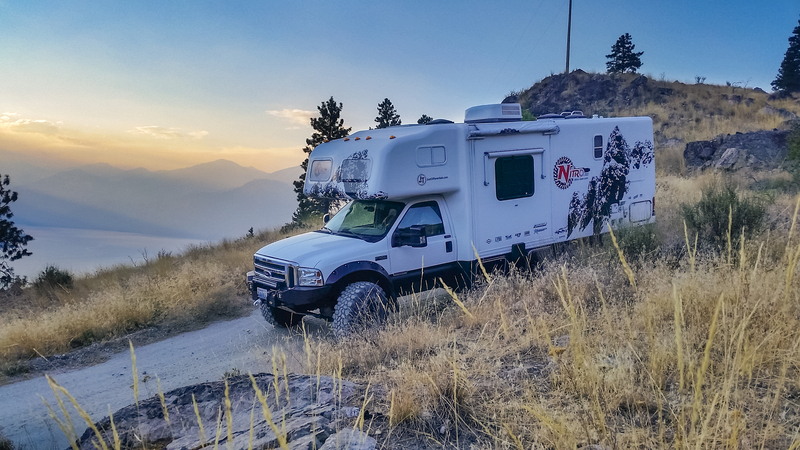 Whether it’s rock-climbing, surfing, snowboarding, or hunting, Nitro Gear’s RV can deliver its passengers to the most remote and secluded site available, so you can be surrounded by nature and not neighbors. To learn more about Just Differentials or Nitro Gears, visit the Just Differentials website here. 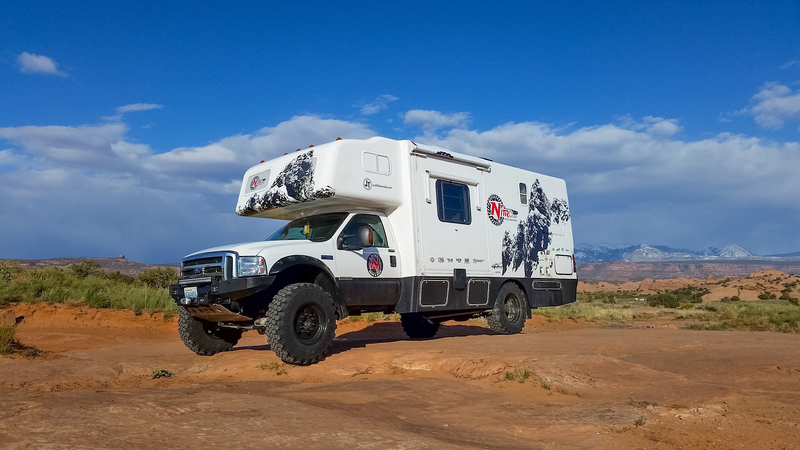 To read the full build thread of this RV, check it out on our forum here.